With the 2017 year quickly coming to an end, the UFC decided to open up the woman’s 125 lb flyweight division. 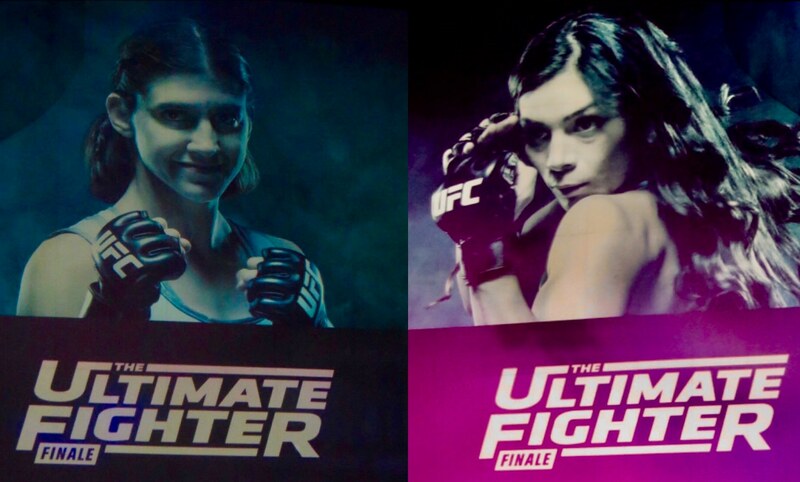 To introduce it to the UFC crowd they choose to have 16 of the top women compete in a tournament on the 26th season of The Ultimate Fighter to name the inaugural women’s flyweight champion. The teams were coached by Eddie Alvarez and Justin Gaethje, two of the most violent warriors in the cage but also respectful gentlemen outside of it. Both of these traits seemed to rub off on their teams as the season was full of exciting fights and finishes but lacked the drama of other seasons. As a long time fan of MMA, what hooked me to this sport were great fighters who were respectful to everyone when they weren’t competing and this time it was pleasant to have a TUF season containing respectful martial artist looking to do their talking in the cage. Boy did the ladies do a great job of representing what this sport should be! While there would be a few last minute (big) changes to the card, these professionals were ready to prove that they belonged. All that was left was to see who would be crowned the UFC’s first flyweight queen. Now us fight fans, unfortunately, know that the real battle is getting through the weigh-ins. In a trend that is becoming frustrating for fans and dangerous for the fighters, once again the attempt to make weight cost us another headliner. This time Sijara Eubanks, who had looked outstanding in her three wins in the TUF House, was forced out of the championship bout after being hospitalized due to weight cutting issues hours before attempting to hit the scales. She had trouble making weight on the show but seemed to have it under better control in her semi-final bout. Hopefully, she can figure out the issues but if she can’t make 125, she may have to move up to 135. Either way, she will be one to keep an eye on in the future. Thankfully, unlike in some past situations, there were plenty of warriors ready to step in her place so the UFC was prepared for this possible situation. Stepping into Eubanks place would be 14-year fight veteran and fan favorite “The Happy Warrior” Roxanne Modafferi. On the show she lost only to Sijara, so she was the perfect person ready to step in. Standing across the cage from her would be TUF’s 14th seed Nicco Montano. The 28-year-old Nicco reached the final after cleaning out her side of the bracket including a semifinal win over 2 seed Barb Honchak. So the stage was set for the final to finally crown the first ever UFC women’s flyweight champ. Would it be the longtime vet Roxy or the steamrolling up and comer Nicco who would be crowned? We would soon find out but there were some exciting bouts to get through first. The card featured four men’s bouts and seven women’s bouts which got off to a quick start. In the opening fight, Gillian Robertson got the night started off with a quick armbar submission of Emily Whitmire just two minutes into the first round. That really seemed to get the trend started for the evening as finishes began to pile up. Shana Dobson followed Whitmire’s win with a second-round TKO over Ariel Beck. A hurt Beck was dropped by punches and was in no condition to continue as the bout was waved off. The third fight saw another fan favorite Rachael Ostovich vs Karina Gevorgyan. Much like the first bout of the evening it only took about two minutes for Ostovich to lock on an armbar, forcing her opponent to tap or walk away with a broken arm. Three fights in and three finishes set the table for the upset and comeback of the night. In the fourth bout, TUF season 23 winner Andrew Sanchez took on Ryan James. Sanchez came in at nearly a 5 to 1 favorite and early in the bout showed why. He battered James around the cage for much of the first round, so much so, some fans in the crowd were even calling for the fight to be halted. But what those fans didn’t know (and the bookies didn’t take into account) was James’ chin and heart. After surviving the first round, James began to take over as a visibly tired Sanchez struggled to mount anything like his first round barrage. One minute into the 3rd James beat Sanchez down with punches until the referee intervened. The night was off to an outstanding start! However, there was only one way to end the preliminary card and Montana De La Rosa gave it to us. Following in the footsteps of Robertson and Ostovich before, Montana locked up an armbar at the two-minute mark, getting her opponent Christina Marks to tap out in the first round. After an outstanding preliminary card of action and finishes, it was time to move to the main and get closer to crowning a new champ! This would also be the first time the UFC has held an event at the Park Theatre in Las Vegas. The intimate venue is outstanding for MMA. The large screens and lighting added a nice flavor to an occasional stale feel some events can have. I would avoid the floor seating but all the rest of the seats seemed to offer a comfortable good view of the action. If they’re going to hold smaller events in Vegas, this is definitely the venue to use. So now it was time to get the main card rolling. After three armbars and a couple of technical knockouts in the prelims, it would be a hard act to follow. However, Brett “The Pikey” Johns did just that. In a matter of 30 seconds, he locked on one of the rarest submissions in all of MMA, a calf slicer. The calf slicer forced his opponent, one-time bantamweight title challenger, Joe Soto to frantically tap out while yelling in pain to the brutal hold. On a bit of an awkward yet funny moment of the evening, I was exiting the restroom earlier in the night when in came Johns followed by an USADA (US Anti Doping Agency) agent. They both walked into a stall and I hear the tester welcome Johns to his office and instructing that he needs to fill the cup. The hassle was probably worth it as the odd submission win earned him a $50,000 dollar performance of the night bonus. With such back to back to back finishes and excitement, it was only a matter of time before we were to witness a less than memorable fight. DeAnna Bennett vs. Melinda Fabian would, unfortunately, be the one to break the excitement ice. After 3 fairly actionless rounds, which included a rare point deduction (Fabian fence grab), the contest would be ruled a majority draw. Luckily for fans, another barn burner was on deck. TUF vet Eric Spicely would meet Gerald Meerschaert. From the opening bell, Meerschaert came out swinging and backing Spicely against the cage. Spicely was able to counter with a takedown and, as Spicely does, quickly took Meerschaert’s back. After locking in a strong body triangle, Spicely beat on his opponent while constantly looking for the RNC finish. Meerschaert’s defense was just good enough and as the round came to an end he was able to reverse position and end the round on top. A few minutes into the second round Meerschaert began to establish control of the fight with his striking. He then found the left kick to the body, landing a couple of strong ones that slowed and backed Spicely up. A third kick from Meerschaert landed flush, dropping his foe instantly to the canvas in visible pain. The exciting fight was a big win for Meerschaert moving his record to 3-1 in the UFC. In the next two bouts leading to the final, the event would feature a strong women’s bout as well as a showcase of an exciting prospect. Earlier in the week, highly ranked and TUF 26 competitor, Lauren Murphy, was brought in as a backup replacement if anyone fell off the card. Luckily that was the case, due to the aforementioned issues with Eubanks weight. While Modafferi moved up to headline in the final, that left another top-ranked 125lber, Barb Honchak, needing an opponent. Murphy stepped in setting up a very evenly matched contest after three full rounds of close action. The fight that saw both action standing and on the ground, was awarded to Murphy via split decision. 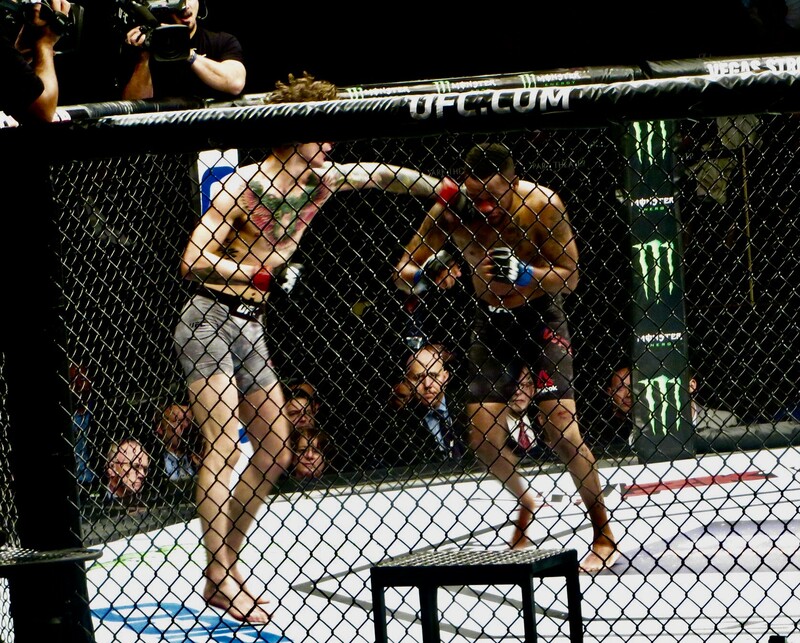 Following that back and forth battle would be the UFC debut of Sean O’Malley who was paired up against the very tough and durable Terrion Ware. Despite a very strong second round by Ware, the striking of O’Malley would be too much, using strong straight strikes as well as a combination of knees and kicks. After three hard contested rounds, he would unanimously be awarded two of them for the win. It was now time to determine which lady would establish herself as the inaugural UFC flyweight champion. Would it be Roxanne Modafferi or Nicco Montano? As the fighters entered and were announced it became very evident that Roxanne, normally being a huge fan favorite, was not this night as the arena was filled with a large contingency of Montano fans. Whether fans from the show or friends and family that traveled from her home state of Arizona, they were loud and supportive throughout the fight. As the fight went underway, it was clear early on that both fighters came to take the title home. The first round saw a back and forth of both striking as well as seeing both get successful takedowns. Nicco landed the better strikes, while Modafferi was able to threaten some submissions and control position and both showed their warrior spirit in a close first round. In the second round, Montano was able to continue landing hard strikes while Roxanne continued to counter back with strikes of her own. 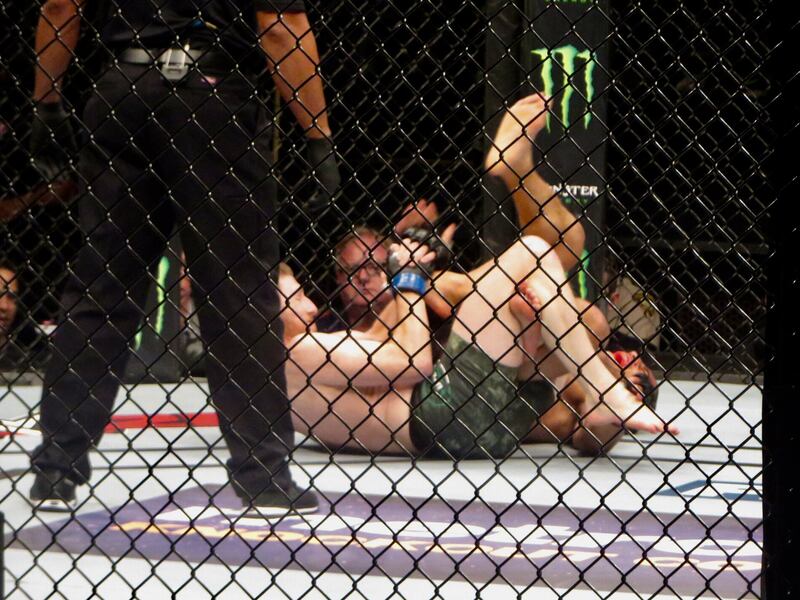 Late in the round, Modafferi got top position while Nicco attempted to finish the fight with a triangle choke. Roxanne, a true vet, remained calm and escaped shortly before the bell. Another close round! The third continued the trend with both women landing punches and kicks on each other at a very high rate. While Modafferi was landing combinations, the harder strikes were being landed by Nicco. A third close round in the books, but it appeared that Montano’s heavy shots were wearing down the vet. The start of the championship rounds again would see a ton of action. Roxanne was able to land sever punches, some heavier than before that seemed to hurt her opponent a bit. Nicco continued to push forward, and after some exchanges was able to secure a takedown with about a minute to go in the fourth round. Nicco got off a few shots on the ground before allowing Modafferi to get to her feet. The live audience showed their appreciation and the horn sounded. It was now time for the fifth and final round of the night. Both fighters, like the warriors that they are, meet in the center of the cage and throw strikes. Nicco is able to control a good part of the round on the ground as well, threatening with some submission holds and landing strikes. She allows Roxanne up and the fight ends with both ladies slugging it out. The crowd stood to cheer both warriors for a very good competitive championship bout. All that was left was to tally the judge's scorecards. While the scorecards when read were lopsided (50-45,49-46,49-46), the fight was very close. The correct name was read however and the first women’s flyweight champion was Nicco Montano. A fitting end to a fun and competitive season for The Ultimate Fighter. It will be fun to watch where she is able to take her career in the future. There is a potential lion's den of killers waiting out there for her. For now, though she should be very proud of her accomplishments and celebrate being a UFC world champion.